Recently I was looking for a book that was handy to take with me for reading in the train. I debated between Mahashweta Devi’s Five Plays and Mary Lutyens’ Krishnamurti: The Years of Awakening. I do not know what eventually made me decide – perhaps the fact that I had already read two of the five plays – but it was an old copy of Krishnamurti that has been with me for several years now that I eventually picked up. I am back from the journey now, and I am only half way through Lutyens’s fascinating biography of one of the most original teachers the world has ever seen. I just finished reading the chapter entitled In Love, which, among other things, deals with Krishnamurti’s falling in love with an American girl called Helen Knothe. I had to stop reading here because my eyes wouldn’t allow me to continue. As a genre I am not particularly fond of biographies and autobiographies, though one of my all time favorite books is an autobiography: The Sky Dancer, by Keith Dowman. Dowman is actually the translator of The Sky Dancer, which is, as the subtitle says, “The Secret Life and Songs of the Lady Yeshe Tsogyel.” The book is what Tibetans call a ‘terma’, a book written for the future and kept psychically hidden until its time came. Yeshe Tsogyel was the chief consort of Bodhisattva Padmasambhava, Tibet’s greatest Buddhist guru. He is the Tibetan Buddha held by the followers of Vajrayana Buddhism as an equal to the Buddha himself, and sometimes even greater. Yeshe Tsogyel practiced tantric sadhanas with Padmasambhava and became an enlightened master and Tibet’s greatest yogini, or dakini, as Tibetan tantric yoginis are called. The book is a tour de force and reading it, depending on how receptive you are to it, could be a life transforming experience. It was, to me. Mary Lutyens is the daughter of Edwin Lutyens, the architect who designed New Delhi, and her maternal grandfather was a viceroy of India. She knew Krishnamurti from 1911, when she was three years old, and her mother was a major influence on Krishnamurti in his early years. She is a part of many of the experiences described in the book, particularly in the very crucial years between 1922 and 1929. Mary, however, appears as a character in the biography, rather than as the narrator. Much of the early part of the book is revealed through Krishnamurti’s letters to Mary’s mother, Lady Emily, whom he addressed in these letters as his ‘dear mother’. I wouldn’t attempt to introduce Krishnamurti here – I assume he should be known to you. Well, if you really do not know, just this much: at one time he was accepted by much of the world as the new messiah that many religions have been waiting for – the new Christ, the new Buddha. And he had the courage to stand up and declare to the world one day that he was no messiah but an ordinary man like anyone of us, and what he is, is something anyone could become through inner awakening. Richard Bach, of the Janathan Livingston Seagull fame, in the introductory chapter of his Illusions, narrates this tale. Once there lived a village of creatures along the bottom of a great crystal river. The current of the river swept silently over them all – young and old, rich and poor, good and evil, the current going its own way, knowing only its own crystal self. Each creature in its own manner clung tightly to the twigs and rocks of the river bottom, for clinging was their way of life, and resisting the current what each had learned from birth. But the one heeded them not, and taking a breath did let go, and at once was tumbled and smashed by the current across the rocks. Yet in time, as the creature refused to cling again, the current lifted him free from the bottom, and he was bruised and hurt no more. But they cried the more, “Savior!” all the while clinging to the rocks, and when they looked again he was gone and they were left alone making legends of a Savior. J. Krishnamurti is the messiah who was reluctant to don the robes of a messiah and showed the courage to tell the world he was like anyone of us and not special, and what he was, is something anyone of us could become, if only we would let go. I once met J Krishnamurti. Met in the sense that I attended one of his sessions in the Krishnamurti Gardens in Chennai, then called Madras in English [Chennai is not a new name – it was Chennai in Tamil even then.]. Perhaps saw is the right word – saw and heard. Mary Luytens’s book on him was published in 1975, and it is in that year that I heard him, or maybe in 1976. We were a small group, maybe around sixty people, and Krishnamurti was then eighty-two years old – he was born on May 11, 1895 [His zodiac sign is the Taurus, like mine!]. What I remember, above everything else, is the way he walked. At eighty-two, he was as sprightly as an eighteen-year old boy! In fact, I do not think a young boy of eighteen would have been able to keep up with him for long – he was so fast, energetic and agile. He came before us and then, with the same nimbleness with which he had walked, ‘leapt’ onto the cement platform under a tree in the Gardens. And the next moment he was speaking to us, cool and relaxed, as poised as the tree under which he sat, and equally serene. His words had an elemental quality to them, and his speech, like his walk and his posture, was not that of an old man but of a youth. It was not an oration – neither in his gestures, nor in his words or facial expressions was there anything oratorical. He spoke to us in simple, everyday words, and he spoke to us as though he has known us all our life. His talk was short and I do not remember a single word of what he told us in that talk – all I retain in me is the memory of his stillness, his serenity and his energy. That memory will remain with me forever. For those who have not read any of his books, I recommend the small Freedom from the Known to begin with. It is a book one could read in a single sitting, but should never. Books like Freedom from the Known are not to be read in a single sitting. They are to be read slowly, relishing each phrase and each image. I read the book when I was passing through a personal crisis. A Swiss friend of mine who was at that time studying with me lent me the book asking me to read it, seeing how troubled I was. My indebtedness to her remains to this day. Incidentally, I believe that was the first Krishnamurti book I ever read, and it had to come from a European girl! I have a close friend who worked for the Krishnamurti Foundation for several years – he frequently shares with me many lesser known incidents from JK’s life, including some about his final moments, which are shrouded in mystery. J Krishnamurti’s Notebooks are filled with his wonderful spiritual experiences, which used to happen to him on an every day basis. Here is one. The moon was quite young yet it gave enough light for shadows; there were plenty of shadows and they were very still. Along that narrow path, every shadow seemed to be alive, whispering amongst themselves, every shadowy leaf chattering to its neighbor. The shape of the leaf and the heavy trunk were clear on the ground and the river down below was of silver; it was wide, silent and there was a deep current which left no mark on the surface. Even the afternoon breeze had died and there were no clouds to gather around the setting sun; higher up in the sky, there was a solitary rose-colored whisper of a cloud that remained motionless till it disappeared into the night. Every tamarind and mango was withdrawing for the night and all the birds were silent, taking shelter, deep among the leaves. A little owl was sitting on the telegraph wire and just when you were below it, it flew off on those extraordinary silent wings. After delivering milk, the cycles were coming back, the empty tins rattling; there were so many of them, single or in groups, but for all their chatter and noise that peculiar silence of the open country and immense sky remained. That evening nothing could disturb it, not even a goods train crossing the steel bridge. There is a little path to the right wandering among the green fields and as you walk on it, far away from everything, from faces, tears, suddenly, you are aware that something is taking place. You know it is not imagination, desire, taking to some fancy or to some forgotten experience or the revival of some pleasure and hope; you know well it is none of these things; you have been through this examination before and you brush all these aside, swiftly with a gesture and you are aware something is taking place. It is as unexpected as that big bull that comes through the darkening evening; it is there with insistency and immensity, that otherness, which no word or symbol can catch; it is there filling the sky and the earth and every little thing in it. You and that little villager who without a word, passes you by, are of it. At that timeless time, only there is that immensity, neither thought nor feeling and the brain utterly quiet. All meditative sensitivity is over, only that incredible purity is there. It is the purity of strength, impenetrable and unapproachable but it was there. Everything stood still, there was no movement, no stir and even the sound of the whistle of the train was in the stillness. It accompanied you as you walked back to your room and it was there, too, for it had never left you. I wonder if the letters Krishnamurti wrote to Lady Emily are available in book form! At one stage in his life, those letters were written practically every day. 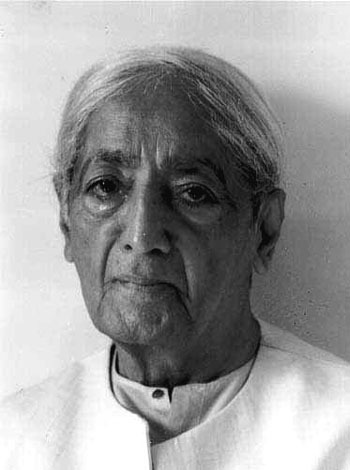 I do not think any other master of Krishnamurti’s level has revealed his inner struggles in such intimate details through correspondence as Krishnamurti does in these letters. St Augustine’s name does come to mind, but then his Confessions are very different in nature and style. I've been told that nowadays very few people in India have heard about the Theosophical Society (est. 1875), yet the main headquarters are still in Adyar, I think, in what used to be the state of Madras. No comments on the life of that mystic should leave out the fact that it was Annie Besant, then the World President of the Society, who tutored him and prepared him for Enlightenment by establishing the Order of the Star of the East, but then, having apparently attained Enlightenment, he rebelled against his governess and ordered the dissolution of the Order, which was greatly embarrassing for her. He announced that he no longer believed that organizations were necessary for the promotion of spiritual evolution.